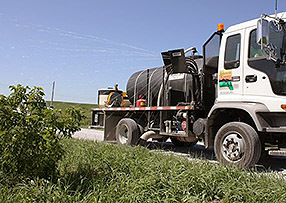 IRVM was introduced to Iowa in the mid-1980s in response to the need for surface water protection. Prior to that time, roadside weed control relied on herbicides blanket-sprayed across the right-of-way. Besides being expensive and contributing to surface water pollution, blanket-spraying was ineffective. By weakening desirable vegetation and creating bare spots, weeds flourished. Replace blanket-spraying with spot-spraying, targeting undesirable species using the right herbicide at the right time. Properly timed, these weed control methods are effective. Naturally adapted to tough roadside conditions, healthy stands of tall, deep-rooted native plants outcompete weeds. The integrated approach to roadside maintenance now extends beyond weed control to erosion control, brush control and stormwater management – all relying, when practical, on the use of native vegetation. Extensive, native plant root systems provide superior erosion control. See our Prairie Roots Project for more. Extensive root systems penetrate 6-8 ft. or deeper, enabling prairie plants to survive drought and high salt concentrations while depriving weed roots of water, nutrients and space. A wide swath of prairie grass in the right-of-way traps blowing snow. Native roadside plantings provide valuable habitat for songbirds, game birds, small mammals and pollinators. 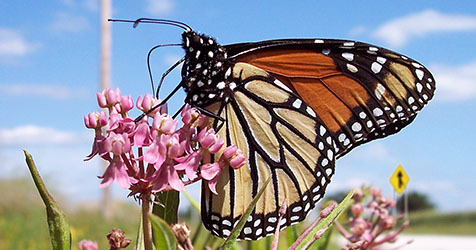 Native plants beautify the right-of-way in a manner that reflects Iowa’s historic prairie landscape.